Is Bangladesh Succeeding in its Battle Against Islamist Militants? Since Bangladesh launched an anti-terror crackdown in response to the high-profile attack on a popular Dhaka café by Islamist militants last July, the country has fortunately not witnessed another major attack on the same scale. Yet sixteen months on from the siege at the Holey Artisan Bakery – during which terrorists massacred 20 civilians with sharp weapons before Bangladeshi commandos stormed the building – fears over violent extremism in the south Asian nation remain ever-present. Despite thousands of arrests and the deaths of top militant leaders at the hands of state security forces, signs of heightened political tensions and evidence of militant activity just below the surface have raised concerns over the potential for separatist violence and a new wave of attacks, in a country which until recently had little past experience of dealing with terrorism. Whilst Bangladesh’s improved law enforcement capabilities have almost certainly prevented further bloodshed over the past year, the government of Prime Minister Sheikh Hasina has faced criticism over its somewhat contradictory approach to confronting terrorism. At the same time as pledging to tackle Islamist militants head-on, the government has been accused of facilitating an environment in which extremist ideology can flourish. This report asks if Bangladesh’s counter-terrorism crackdown will ultimately prove successful in keeping a lid on militant activity, and asks whether the government in Dhaka is doing enough to combat the radical ideology which fuels such violence. The issue of terrorism in Bangladesh first caught the world’s attention in 2015, after an unrelenting wave of small-scale attacks targeting secular bloggers, university professors, foreign citizens and members of religious minority groups. In all, more than 20 people were shot dead or hacked to death in a two-year period by Islamist militants, with attacks often taking place in broad daylight. The level of violence was unprecedented in what is usually considered one of the most secular and tolerant Muslim-majority countries, especially in comparison to regional neighbours Afghanistan and Pakistan, which have long been blighted by sectarianism, religious intolerance and suicide bombings. The attacks made global headlines and hit the tourism industry and Bangladeshi economy hard. PM Sheikh Hasina’s government blamed the attacks squarely on domestic jihadist group Jamaat-ul Mujahideen Bangladesh (JMB), which it said were linked to its political opponents and seeking to destabilize the country. This was despite claims of responsibility for some of the attacks by trans-national jihadist groups including the Islamic State (ISIS) and Al-Qaeda in the Indian Subcontinent (AQIS). Neither claim could be proven concretely, however the government’s investigation into the attacks was roundly criticized at the time as few people were brought to justice over the killings. The attack on the Dhaka café in July 2016 – often described by analysts as ‘Bangladesh’s 9/11’ – was seen as a game changer, and prompted the government to take concrete action. A sweeping security crackdown followed and large-scale police raids led to the arrest of thousands of suspected terrorist sympathizers across the country, whilst a number of senior militant leaders were killed during security operations. Nine suspected militants were killed in the Kalyanpur neighbourhood of Dhaka just three weeks after the café attack, whilst on 27 August last year police claimed to have killed the head of ISIS in Bangladesh – Tamim Chowdhury – during a raid in Narayanganj. A newly-formed Counter-Terrorism and Transnational Crime Unit (CTTCU) of the Dhaka Metropolitan police took on hundreds of new recruits was granted a national mandate several months after the café siege, and has overseen counter-terrorism operations across the country. Authorities have clamped-down hard and have received much praise for their actions. However, a number of small-scale suicide bombings earlier this year reignited fears and indicated a possible shift in tactics away from the knife attacks witnessed in the past, towards more sophisticated and well-planned operations of the nature seen in Afghanistan and Pakistan. Whilst the threat appears to have been contained for now, these developments show there is little room for complacency – especially given that some of the driving factors behind Bangladesh’s surge in terrorism over the last few years remain unresolved. The initial wave of machete attacks on secular bloggers and foreign citizens came after a period marked by what some analysts describe as a ‘creeping Islamism and sectarianism’ in Bangladeshi society. The rise of religious intolerance was evidenced by two attacks on Shia targets in late-2015. First, a bomb blast targeting a procession outside a Shia shrine left two people dead, before a few weeks later a Shia mosque in Bogra was attacked, killing one person and wounding several others. These attacks on Shia targets – a minority group in Sunni-majority Bangladesh – raised suggestions that some in Bangladesh were becoming increasingly sectarian in mindset. Longer-term factors have also played a role. Following the country’s 1971 independence war, senior leaders from the Jamaat-e-Islam party were convicted many years later on charges of crimes against humanity, with several of them sentenced to death by hanging. These events have stoked anger and exacerbated tensions in Bangladeshi politics which remain close the surface to this day. The Jamaat-e-Islam party is part of the current opposition alliance to the ruling Awami League, which has been in power since 2009. Divisiveness has been a key feature of the political scene in recent years, which has only worsened as the government has linked the terrorist JMB group to opposition parties. In this sense, the government’s counter-terrorism campaign must be viewed in the broader domestic political context. The debate over naming perpetrators and ascribing blame following terror attacks has become a heavily politicized issue. Despite numerous claims of responsibility from international terror groups – including for the Dhaka café siege – Sheikh Hasina’s government has continued to deny the presence of ISIS or AQIS within the country’s borders, referring only to the JMB group and domestic political forces looking to ‘destabilize the government’. This language has facilitated a corresponding crackdown on opposition political parties such as Jamaat-e-Islam and the Bangladesh National Party (BNP), exacerbating concerns that Hasina’s administration is becoming increasingly authoritarian in its approach to governance. More worryingly, absolving ISIS and AQIS of responsibility allows them to act with impunity – if indeed they are directing attacks within Bangladesh – and establish a firmer foothold under-the-radar. Whilst launching a crackdown and condemning Islamist terrorism, the government’s approach has also been contradictory. At the same time as appearing to clamp down on terrorist elements, PM Sheikh Hasina has several times in the past warned secular bloggers for criticizing religion, saying ‘I don’t consider such writings as free-thinking but as filthy words. It is not at all acceptable if anyone writes against our prophet or other religions’. Some have labelled this as victim-blaming, and say it constitutes a sympathetic attitude towards terrorism, facilitating recruitment and legitimizing extremist ideology. At the very least, many argue that it is an attempt to stifle debate and restrict freedom-of-speech in a country which had been considered relatively open. Despite these problems, a high-profile attack on the scale of the Dhaka café assault has not been repeated, to a degree validating the government’s strategy and indicating its improved counter-terrorism capabilities. The tide of less-sophisticated lone-wolf attacks has also slowed markedly. However, this type of attack is extremely difficult to guard against as perpetrators make use of easily-obtainable weapons and often have no known links to militant organizations. When incidents do occur, the government continues to blame local groups such as JMB. And it is true that concrete links between domestic militants and ISIS or AQIS have not been proven, despite claims of responsibility. Yet the politicization of terrorism remains a concern, and a clear distinction must be made between political parties and militant groups unless there is concrete evidence to suggest otherwise. The government’s denial of ISIS presence in the country raises fears that the violent ideology of transnational jihadist groups is being underestimated. As ISIS continues to lose ground in Syria and Iraq, it may look to further its recruitment in south Asian countries, including Bangladesh. As we have seen recently in the southern Philippines, local groups can be heavily influenced by such ideology and act upon it, whether concrete links to international groups exist or not. As a result, the authorities in Bangladesh must remain vigilant and alert. The anti-terror crackdown has undoubtedly made progress, but this alone is not enough. Violent ideology must be countered and criticized, meaning that the space for those who wish to defend secular ideals – as well those who wish to defend various strains of religious thought – must be protected in Bangladesh if violent extremism is to be defeated in the long-run. This in-depth feature is an extended version of an article published on Asian Correspondent. More than four decades after the last bomb fell from the skies above the remote and landlocked Southeast Asian nation of Laos, its countryside remains littered with deadly remnants from a conflict which long-ago faded into distant memory for many in the West. For the people of Laos however, the harmful impacts of the Vietnam War continue to reverberate deep into the 21st Century. A covert nine-year US bombing campaign resulted in more than two million tonnes of ordnance being dumped on Laos between 1964 and 1973. This campaign was dubbed the ‘Secret War’, as the raids were conducted without the authorization of Congress and without the knowledge of the American public. During the onslaught around 30,000 people were killed or maimed, and an additional 20,000 casualties have been incurred since the campaign ended, as civilians have inadvertently come into contact with unexploded ordnance (UXO) left behind. In recent years there has been a marked reduction in annual deaths and injuries – from more than 300 in 2008 to less than 50 last year – following an intensification of nationwide clearance efforts. However, this success in reducing the direct physical impacts of UXO must not blur the wider humanitarian legacy of the US bombing campaign in Laos: less than 2% of the total contaminated land area has been cleared, in a country which remains amongst the poorest in the region. In short, UXO serves as a major and debilitating impediment to Laos’ development. Around 80 million cluster bomblets remain hidden in forests, submerged along river banks and buried in fertile soil. This extensive level of contamination renders large swathes of agricultural land unusable, denting crop production and worsening food insecurity. The presence of UXO also hampers construction: vast areas of land need to be painstakingly cleared before building work can begin, making infrastructure projects more dangerous, costly and time-consuming. The long-term injuries suffered by victims have also created a nationwide disability crisis, placing a huge burden on the country’s overstretched healthcare system and depriving many families of income. These effects combine to harm social and economic development at both the local and national level, leaving many Laotians unable to escape a life of isolation, poverty and hardship. Before assessing the impacts of UXO on development in more detail, it is essential to first trace the history of the UXO problem in Laos: from the Vietnam War and subsequent bombing campaign to the more recent clearance efforts of the last two decades. The US bombing of Laos has long been overshadowed by the wider narrative of the Vietnam War, which began in 1955 and ended when Saigon fell twenty years later. The conflict was often viewed through the lens of the wider struggle between the two global superpowers of the Cold War era, when the US sought to contain the spread of communism through halting the ‘domino effect’ in Southeast Asia. In this context in the early 1960s, large numbers of US troops became engaged in an increasingly bloody and intractable ground war against the communist North Vietnamese. By 1963, the war had spilled across Vietnam’s long and snaking western border. North Vietnamese troops began smuggling arms and equipment to south Vietnam along the Ho Chi Minh Trail; an overland supply route carved through the dense forests of neighbouring south-eastern Laos and eastern Cambodia. At the same time, Pathet Lao communist fighters were increasingly engaging in battles with the US-backed Royal Lao Army in northern Laos, further raising US concerns over the ‘domino effect’ in the region. In December 1964, the US responded to these developments by launching what became the most extensive bombing campaign in history, aimed at disrupting activity along the Ho Chi Minh Trail. Congress had not been consulted and for several years the US government denied the existence of the campaign, referring only to ‘reconnaissance flights’ over Laos. Over the next nine years Laos became the most heavily bombed country, per capita, in the world. In total, US aircraft flew more than 580,000 sorties and dropped more than two million tonnes of ordnance. Cluster bombs – each containing up to 700 smaller bomblets which are released mid-air and dispersed over a wide area – were the most frequently-used weapon. Around 260 million bomblets in total were dropped during the campaign. Of these, around 80 million failed to detonate and now make up the bulk of UXO remnants littering the countryside. The scale of contamination is in fact so severe that UXO are present in 14 of Laos’ 17 provinces. The true extent of the campaign only became public knowledge after a series of US Senate hearings in 1971, which first exposed the ‘Secret War’ in Laos. Over the decades, further details have emerged as state department documents have been declassified and US military strike records have been released. Despite an initial public outrage the suffering inflicted on Laos remained in the headlines for only a relatively short period of time. Four-and-a-half decades on, the affair has drifted from public consciousness and has been largely forgotten. The impacts on the civilian population have been overwhelming. More than 50,000 people have been killed or maimed since the bombing started in 1964, with 20,000 falling victim since the campaign ended in 1973. Children are disproportionately affected as they often mistake spherical cluster bomb casings for toys, accounting for 40% of UXO casualties. Most accidents are caused by direct impact. This can occur when agricultural workers dig the soil, when villagers attempt to move or defuse bombs themselves, and when children mistakenly play with cluster bomblets. The burgeoning scrap metal trade in Laos has also exacerbated the problem, leading many impoverished residents to take huge risks for a quick financial return. In the past twenty years UXO clearance efforts have gathered pace after several decades of inaction. In 1996 the Lao National Unexploded Ordnance Programme (UXO-Lao) was established. UXO-Lao works with NGOs and international partners to co-ordinate nationwide clearance efforts on the ground. This was followed ten years later by the establishment of a National Regulatory Authority (NRA) to oversee the management of the UXO sector. International NGOs such as Mines Advisory Group, Handicap International and Legacies of War have played a vital role in raising awareness and undertaking complex removal work. The direct humanitarian impacts of UXO in Laos are slowly receding. In the past two decades, more than 1.4 million UXO items have been destroyed and more than 3 million people living in the most heavily-contaminated areas have attended risk education classes. UXO-Lao says that since 2010, UXO clearance has made possible the construction of 478 new schools, 78 water systems and 75 new roads. In addition, the rate of death and injury from UXO has been reduced by 86% since 2008, with the government now aiming to limit casualties to less than 40 per year. These figures are encouraging, yet still more needs to be done to tackle the huge scale of the problem: it is worth remembering that less than 2% of contaminated land has been cleared. Taking time to consider this reality – that 98% of contaminated land remains littered with UXO – allows for further reflection on the potentially hidden, longer-term and more indirect implications of the US bombing campaign. In this sense, it must be asked: to what extent has UXO impacted Laos’ development? Despite achieving annual GDP growth of above 8% in the last few years, Laos remains one of the poorest countries in Southeast Asia. In the latest version of the UN Human Development Index, Laos is ranked 138th out of 188 countries, with only Myanmar (145) and Cambodia (143) faring worse in the region. Whilst there are numerous factors determining a country’s level of development, it can be argued that in the case of Laos, UXO contamination plays a unique role in stunting progress. The correlation between UXO and underdevelopment is most visible through the prism of poverty. According to the World Bank, 41.7% of people in Laos earn less than $3.10 per day, whilst 16.7% of the population earn less than $1.90 per day. This represents a higher proportion of people living below the poverty line compared to other Southeast Asian states. In addition to a high poverty rate at the national level, a growing divide is emerging between urban and rural areas. The UNDP reported that the poverty rate was three times higher for the 63% of Laos’ population whom reside in the countryside, where the UXO threat is greatest. In fact, the correlation between poverty and UXO contamination is stark, with 42 of the 46 poorest districts being in areas with widespread UXO presence. This trend is especially pronounced in remote mountainous areas where it is more difficult to conduct clearance operations, and along the border with Vietnam where bombing was heaviest. The correlation between UXO contamination and poverty is clear, yet explaining exactly why the presence of UXO exacerbates poverty and worsens development outcomes is a more complex undertaking. In this sense, UXO contamination has negative implications in three broad areas which are vitally important to Laos’ development: agriculture, infrastructure and healthcare. Firstly, UXO hampers agricultural production and worsens food insecurity. Even before the bombing campaign, Laos already found itself disadvantaged due to its rugged mountainous geography. Agricultural land accounts for only 10% of total land area, according to the Asian Development Bank (ADB). This is amongst the lowest in the region, and far less than neighbours Thailand (43%), Vietnam (36%) and Cambodia (33%). The presence of UXO across half of Laos’ arable land compounds these existing geographical disadvantages, meaning that only a small proportion of fertile land is able to be farmed. UXO has hit food production hard, leaving the country incapable of providing adequately for its burgeoning population, which now stands at 6.9 million. As a result, rates of malnourishment are amongst the highest in the region. A 2016 study found that 18.5% of the population were undernourished, compared to 14% in Myanmar and Cambodia, and 11% in Vietnam. Laos was also found to have the highest rate in the region of stunting in children under five years of age, which stands at a staggering 43.8%. As the population continues to grow, food insecurity is likely to worsen. This is already pushing villagers to take great risks in attempting to conduct UXO clearance themselves and farm land which may be contaminated. Whilst it is true that geographical constraints have historically restricted agricultural development in Laos, it is equally undeniable that the widespread presence of UXO – rendering hundreds of square kilometres of farmland unusable – is a decisive factor in explaining the difficulties endured by Laotian farmers and the poor performance of the country’s agricultural economy. Secondly, UXO acts as an impediment to the provision of critical infrastructure. Laos’ geographical features – notably its mountainous terrain, dense jungles and lack of coastline – unfortunately serve as natural barriers to construction and free-flowing trade, yet the presence of UXO again compounds these problems. As a landlocked nation, Laos depends on overland transportation to move goods around the country, yet UXO contamination makes the construction of transport routes more dangerous and time-consuming than almost anywhere else on the planet. Land must be extensively surveyed and painstakingly cleared before construction work can begin, lessening the incentive for foreign investment in infrastructure projects. As a result of UXO, Laos is desperately lacking in adequate road and rail links, leaving vast areas of the country isolated and disconnected from the main urban centres of Vientiane and Luang Prabang. This makes it difficult for goods to be transported to and from the countryside, leaving many rural areas to sink deeper into poverty whilst the cities prosper. Large construction projects also face considerable delays and extra costs as a result of UXO contamination. For example, construction of the 1,075-megawatt, 350-metre tall Nam Theun II Dam, completed in 2010, was only able to get underway after three years of prior UXO removal work costing almost $17 million. The Dam project provides just one example of the many instances where additional costs have been incurred to build on UXO-contaminated land. Thirdly, UXO has placed a huge burden on the healthcare system in Laos. There are more than 12,000 survivors of UXO accidents across the country, most of whom have some degree of disability and will require support for the rest of their lives. The most common injuries sustained are the loss of a limb, blindness, hearing loss and shrapnel wounds. It is estimated that 40% of survivors require limb amputation, leading Laos to have one of the highest rates of disability globally. In the heavily-contaminated Xieng Khouang province alone, there are more than five-thousand disabled residents. The high amputation rate results from the majority of incidents occurring in remote, inaccessible areas, meaning that professional medical attention is often several hours away. The strain placed on Laos’ fragile healthcare system is overbearing. Many facilities are ill-equipped to deal with the severity of injuries in the immediate aftermath of an accident; for example, blood transfusions are often not possible in rural clinics, meaning that blood loss, rather than the injury itself, is a leading cause of death amongst UXO victims. In the longer-term, survivors require years of physical rehabilitation, psychological counselling, and custom-made devices to replace missing limbs. Survivors face difficulty in resuming their normal lives, and households are plunged into poverty as families become unable to rely on the productivity of the main breadwinner. Relatives are forced to give up work to help care for injured family members, whilst children often stop attending school and instead seek employment to replace lost income. The poverty-inducing effects of blast injuries and the additional burden placed on health services exacerbates the negative impacts of UXO on development. A high rate of disability means a depleted workforce, whilst families are weighed down under the burden of care, leaving tens-of-thousands of Laotians unable to contribute towards economic growth. In recent years the UXO problem has been addressed with greater urgency, alongside a growing recognition that UXO poses a threat to development. In September 2016, Laos’ Prime Minister Thongloun Sisoulith and then-UN Secretary General Ban Ki Moon inaugurated a new sustainable development goal for Laos, entitled Lives Safe from UXO: Remove the UXO Obstacle to National Development. This initiative – known as SDG18 – aims to further reduce casualties, address the needs of victims and clear the highest-risk areas by 2030. Last year the government also announced plans to carry-out a nationwide UXO survey, aiming to produce a reliable estimate of contamination across the country by 2021. This will enable the most heavily-contaminated areas to be prioritized and facilitate closer co-ordination between UXO-Lao, international NGOs and private sector firms. The successful visit followed a period of sustained engagement with Laos as part of the previous administration’s ‘pivot’ towards Asia, in which the US sought closer alliances with ASEAN member states as a counter to China’s growing influence in the region. However, Donald Trump does not appear to view Southeast Asia as such a high priority, prompting concerns over future UXO funding and raising questions over whether the US commitment to ‘‘help Laos heal’’ will be a long-term one. 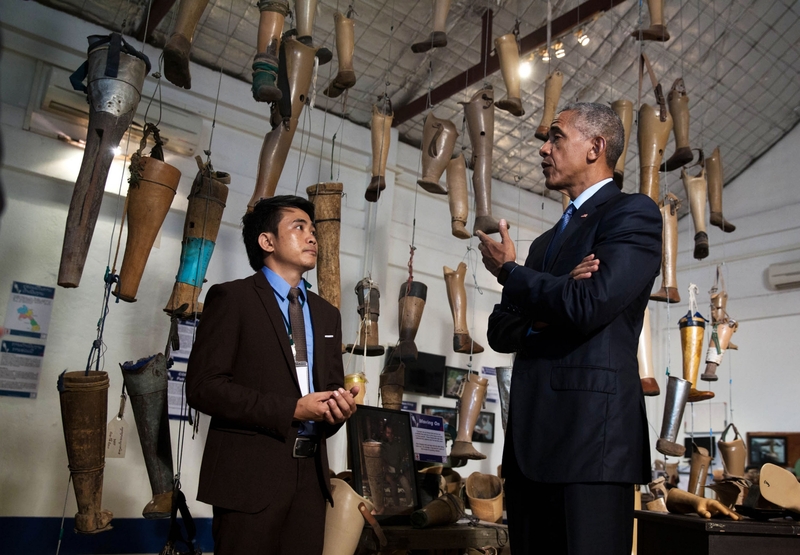 Over the last two decades, steady progress has been made in tackling the UXO threat in Laos. The US has finally recognized the harmful legacy of the covert bombing campaign it conducted during the Vietnam War, which was overwhelmingly disproportionate in terms of its devastating long-term impact on civilians. In the last few years, greater engagement and funding has enabled clearance operations to move forward at a faster pace. In humanitarian terms, the recent intensification of clearance work has brought dramatic improvements: casualty numbers have reduced to an all-time low, and the majority of the rural population are now aware of the dangers posed by UXO. Yet there remains an awfully long way to go. Four decades on from the US’ ‘Secret War’, its humanitarian legacy may be fading; but its developmental legacy persists. Despite recent economic growth, Laos still lags behind its neighbours and remains amongst the poorest nations in Southeast Asia. Given the painfully slow and careful nature of the work required to clear even the smallest area of land, UXO contamination will continue to pose a severe impediment to Laos’ development for decades to come. The widespread presence of UXO compounds the natural constraints imposed by Laos’ mountainous geography, denying it the opportunity to lift itself out of poverty and join Southeast Asia’s growing band of middle-income countries. The ongoing experience of Laos serves as a painful reminder of the potential for conflicts to kill, maim and hold back development long after they have been consigned to the history books. Given the fact that only 2% of contaminated land has been made safe since clearance activities began more than 20 years ago, further international engagement and funding reassurances will be needed if there is to be a sustained, long-term effort to tackle the crippling legacy of UXO in Laos. In the Indonesian province of West Papua, a movement for independence has existed since the early 1960s. Located at the country’s easternmost point, West Papua came under Indonesian control in a disputed UN-backed referendum in 1969, sparking an independence struggle which has taken place far from the gaze of the outside world. Over the past five decades this seemingly intractable conflict – and its competing narratives – have been largely forgotten by those outside the region. In recent years however, the dispute has gained greater international attention as a result of more organized efforts on the part of independence activists, alongside a growing network of concerned politicians around the globe. Yet despite this upturn in media coverage, civil society action and political manoeuvring, the call for a new referendum on West Papua’s future remains unlikely to be granted. The origins of the dispute date back to the mid-20th Century, when the area was under Dutch colonial control. Indonesia became an independent state in 1949, yet West Papua remained under Dutch control throughout the 1950s. As calls for West Papua’s own independence grew throughout the decade, leaders in the area held a Congress in 1961 and for the first time raised their own flag – known as the ‘Morning Star’. Conflict over the territory soon broke-out between Indonesia, West Papua and the Dutch colonisers, until a UN-sponsored treaty – known as the New York Agreement – was brokered in 1962. The agreement initially gave control of West Papua to the United Nations, before transferring control to Indonesia with the promise that a referendum would be held on the future of the territory. When the ballot – known as the ‘Act of Free Choice’ – was finally held in 1969, it did not resemble a referendum as had been promised by the UN. The Indonesian military selected just over one-thousand West Papuan leaders to vote on behalf of the entire population. All of those eligible to take part voted in favour of the territory being incorporated into Indonesia – yet reportedly did so within an atmosphere of intimidation and under the threat of violence. In a much-criticized move, the decision was later authorized by the UN, and West Papua was officially incorporated into Indonesia. Local resentment against the decision was strong, with many labelling the referendum as an ‘Act of No Choice’. The perceived injustice following the referendum result gave rise to the independence movement which has spawned in the decades since, and this injustice remains a key motivating factor amongst those still seeking independence today. Resistance has taken several forms. An armed guerrilla group – called the OPM (Free Papua Movement) – was formed in 1970, and has carried out a number of attacks on Indonesian security forces and against multinational corporations operating in the area, particularly in the mining and resource sector. In recent decades, the independence movement has become more peaceful and political in nature, particularly since the fall of Indonesia’s former military dictator, General Suharto, in the late 1990s. In 2000, a public congress was held, and the Papuan Presidium Council (PDP) was formed in an attempt to gain recognition for the independence struggle; yet this project eventually failed after crackdowns by the Indonesian security forces and internal divisions within the group. More recently, several campaign groups have formed and have become better organized, holding demonstrations in the region and in other countries, to raise awareness of the situation. Over the last five decades, information on the situation in West Papua has been difficult to obtain and verify, as foreign journalists and non-governmental organizations have largely been banned from the province. However, numerous human rights violations have reportedly been carried-out by the Indonesian security forces, including accusations of torture, murder, intimidation and arbitrary arrests. In addition, many people from other parts of Indonesia have been moved into the province, in what could be viewed as an attempt to lessen the influence of West Papuan culture. The conflict long-ago reached a point of stalemate, with the dispute refusing to recede despite the fact that almost 50 years have passed since the original referendum took place. There are multiple reasons why the dispute has become so intractable, not to mention the firmly-ingrained competing interpretations of the situation, which prevail on each side of the debate. From the perspective of the West Papuan independence movement, the grievances felt in the 1960s have not subsided over time, and continue to drive the struggle today. First and foremost, the perceived historical injustice at the way the referendum was conducted remains strong. Other secondary factors have added to this feeling of injustice in the years since, including reports of human rights violations, cultural marginalization and economic disadvantages. From the perspective of the Indonesian government, the territory was always rightfully obtained under a legal referendum, with the result sanctioned by the UN, thus resulting in legitimacy to govern and support from the international community. Many of Indonesia’s allies and closest neighbours – notably Australia – have long supported Indonesia’s sovereignty over West Papua. The province has come to occupy a central location in Indonesia’s national imagination, and is of huge economic importance due to its rich mineral resources. As a result, Indonesia has gone great lengths to secure control over the area, through maintaining a strong military presence and effectively closing the region off to international observers. In recent years, Indonesia has been accused of carrying-out large-scale arrests of demonstrators and members of the independence movement, whilst the government has repeatedly urged other nations to respect Indonesia’s sovereignty. In this sense, the status-quo has undergone little change. Yet last year, the independence campaign appeared to pick up pace, with a global conference on West Papua held in London in May 2016. Members of the ‘Free West Papua’ movement were in attendance, along with members of the ‘International Parliamentarians for West Papua’ (IPWP) group, including the current UK Labour Party leader Jeremy Corbyn. At the meeting, prominent pro-independence leader Benny Wenda urged the UN to initiate and supervise a new vote for independence in West Papua, to make up for the perceived failings of the 1969 UN-backed vote. The reinvigorated pro-independence campaign serves as evidence that despite Indonesia’s tight control of the province, and despite doubts over whether West Papua would be able to survive as an independent nation, calls for a new referendum are unlikely to subside. In fact, the independence movement appears to be more resilient and better-organized than at any time in recent history. The involved parties are aware that persuading Indonesia to hold a new referendum is an unlikely prospect. Yet irrespective of the campaign’s long-term success or failure in terms of achieving an independence vote, it serves an important purpose in raising awareness of the human rights situation faced by civilians in West Papua. Since being elected in 2014, Indonesian president Joko Widodo has visited the region and shown greater interest in its development than his predecessors, raising hopes of an improved economic and human rights situation for the local population. If President Widodo is serious about his pledge to improve livelihoods and repair Indonesia’s damaged reputation in West Papua, then opening-up the region to foreign journalists and human rights organizations would be a positive first step.